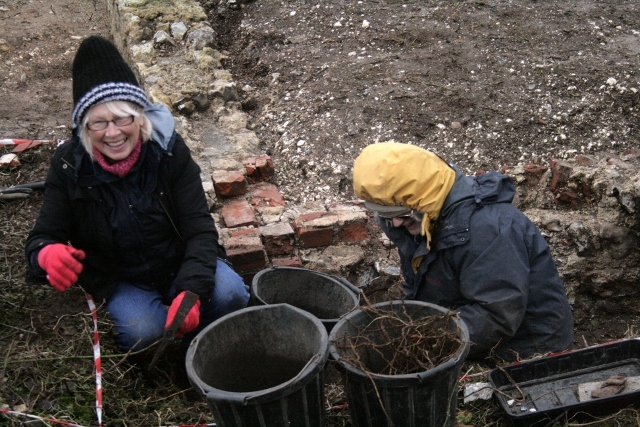 The day’s dig, finishing off the trench to the east of the south end of the cottage went well, especially with the help of a regular volunteer who hadn’t been up on site since before Christmas. She was very impressed by our progress. Unfortunately, the day’s finds were not as impressive as before, a few decorated ceramic shards being the best. We had obviously moved away from the midden deposit we were digging previously. Perhaps more interesting was the broken half of a cast iron fireback embedded in a large piece of very poor quality concrete and brick demolished masonry, which we had excavated about 3 weeks ago, but which was too large to carry home. Since being exposed to the elements it was starting to corrode, so the masonry block was broken up to remove this valuable find. 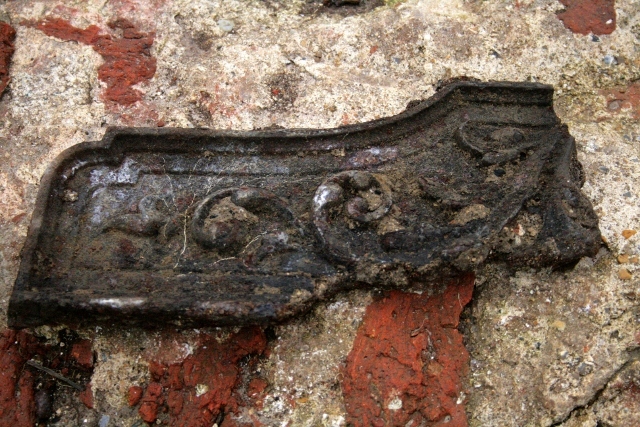 This revealed that it was its reverse side which had been uppermost, which strongly suggests that the original fireplace may have been partially bricked-up. Looking SW at Newmarket Farm Cottage; 19thc. 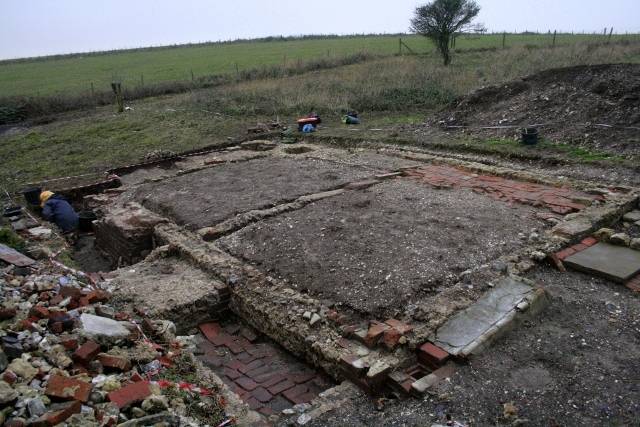 kitchen with remains of chimney base to far left (E side of S room), washhouse to front right (N). We think this would most likely have occurred, based on our earlier research, when the kitchen was moved into the cottage’s former washhouse. This move was made possible by the advent of cheap paraffin stoves sometime in the 1900’s. This would create a living room (or parlour if they wanted to be posh) with a need for a much smaller, more fuel efficient, hearth. I love it when our research and the archaeology come together! So last season’s dig stays open whilst we wait for a clear window in the weather (and in the busy schedule of SeSurveying), or the weather turns cold enough to seriously damage the archaeology – whichever comes first. 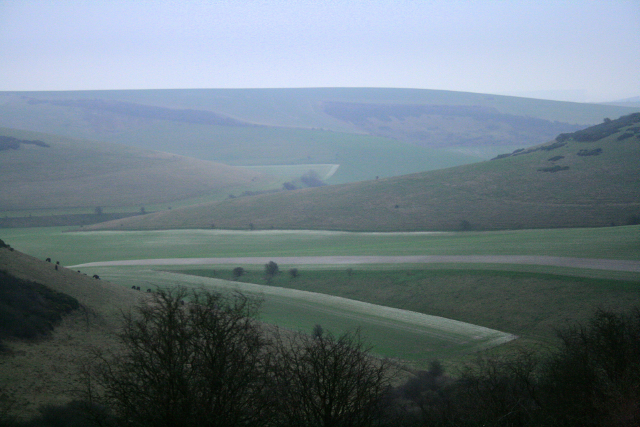 Looking SE at the view from Newmarket Farm.